El Bolsón has a reputation as Patagonia’s chilled-out hippy haven and its main attraction is the El Bolsón Regional Fair. Set in the main square, Plaza Pagano, the fair has grown since its inception in the early 1970s to become Patagonia’s largest street fair. Depending on the season, the Feria Regional de El Bolsón features 200-300 stands at any one time, all featuring homemade goods. 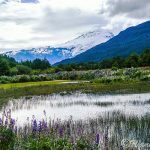 Set among the backdrop of the snow-capped Mount Piltriquitron peaking into the vast Patagonian sky, the scenery and relaxing, bohemian vibe at the fair make this a worthwhile side trip from Bariloche, less than two hours away. Thanks to this valley’s mild Mediterranean micro-climate, ideal for organic farming, hops and berries are the centerpiece of El Bolsón’s harvest. In summer, vendors stroll the crowds in the plaza selling boxes of locally grown strawberries, blueberries, raspberries, blackberries, cherries, elderberries and currants. Delicious handcrafted beers, including fruit beers, are available year round. If it’s great food you’re after, bushels of berries aren’t the only choice. Colorful caravan food stations parked near the mini amphitheater offer some tasty options for the hungry market goer. The shawarma van’s long lines attest to its popularity, serving up the Arabic–style sandwiches with meat, salad, hummus, and garlic sauce for around US$6. Thirsty? The smoothie and juice vans focus on the Patagonian fruits, serving up a variety of berry nectars and smoothies. The ‘Empanadas Armenias’ stand set on the main market path is a not-to-be-missed stop for its rustic meat empanadas, ideally accompanied by a large cerveza (beer) while strolling the market. El Bolson’s fair is the ideal location to purchase handmade souvenirs from the south, especially if seeking something a little different from the mass produced trinkets of commercial gift stores. Here visitors can find homemade cuckoo clocks (a nod to the area’s German ancestry), fragrant handmade soaps, delicious liqueurs, unique candles, and homemade jams and teas from the region. The leatherwork on display is impressive with some stalls selling stunning chic handbags and totes. As a tourist-oriented market, the products aren’t the cheapest finds out there, but the quality is evident.